“Your sessions unblocked me.” – Jared G.
As a certified Amherst Writers & Artists leader, I lead multi-genre workshops based on the productive and supportive AWA method originated by Pat Schneider. My venues include New Jersey’s Adult School of Montclair, County College of Morris extension classes, and private groups. For ten-plus years, it’s been my honor and privilege to help hundreds of adult learners achieve their writing dreams. My workshops include the following. All of them can be structured as single intro sessions or multi-week cycles. “Thank you for providing such a consistent opportunity for writing. I always feel so good after one of our meetings, and I know that writing regularly with you makes all of my writing easier.” – Madelyn H.
Writers of all ages, professions, skill levels, and genres are warmly welcomed in my groups. You need not submit a writing sample. The only requirements are your willingness to write and to be a constructive group member. 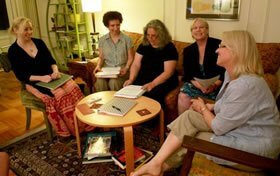 Private workshops: I lead two Amherst-method writing groups in Montclair, NJ. They are currently filled, but let me know if you’d like to be on a waiting list. Customized workshops: Have pen, will travel. Contact me to custom-schedule a half-day writing or publishing workshop on a Saturday or Sunday. Ideal for reading groups who want to experience life from the writer’s side of the page, or for writing groups who want feedback or publication strategies. “Please excuse the cliché, but you are, Marian, a born teacher.” — F. N.
I lead single-session workshops for businesses and clients such as Columbia University’s Human Resources Department on the following subjects. Most sessions run for two to four hours. Please contact me for details and fees.